So I originally planned this “detox” to cleanse my body of all the heavy foods I’ve been indulging in over the last month. Temporarily going back to my vegetarian ways, I’ve even sided more on the vegan outlook, minus the sweet touch of honey now and again. I must say, this diet change has been revitalizing! Rejuvenating! I feel born again into the wonderful world of herbivores! So why, with this plethora of fruit and veg, is my belt tightening? Because I have a problem – a cooking problem. Can anyone else subscribe to Indulgence Anonymous? Anyone? Here’s the situation: I so LOVE cooking and food and eating that I am tastifying stereotypically dry nut-and-berry diets, thus filling myself to capacity. 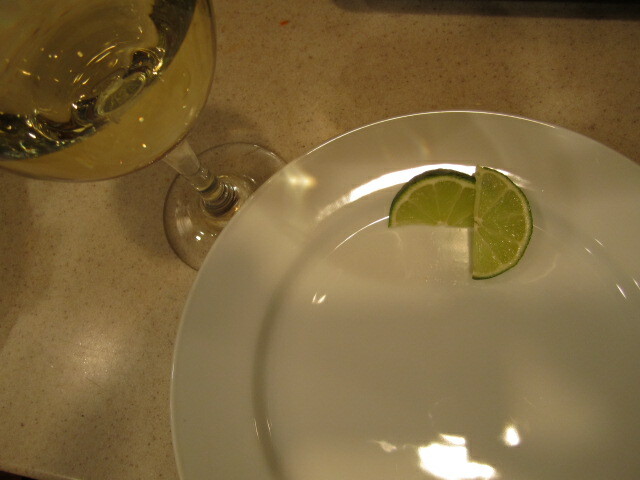 Maybe I can coin the next fad diet: Overeating Detox. Hmm… kind of sounds like Jumbo Shrimp. 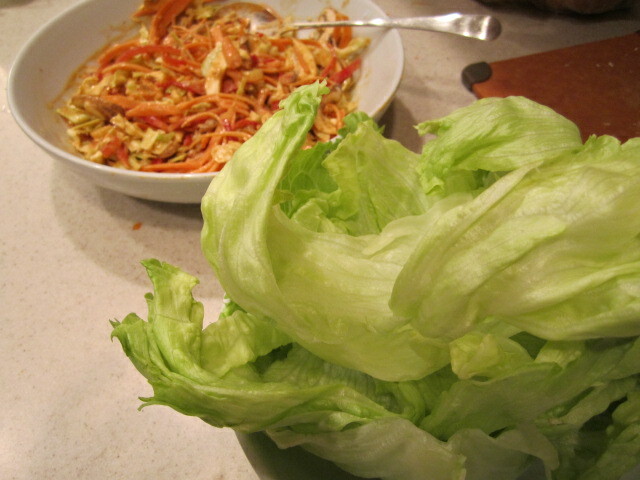 Take, for example, last night’s Chinese Peanut Lettuce Wraps. 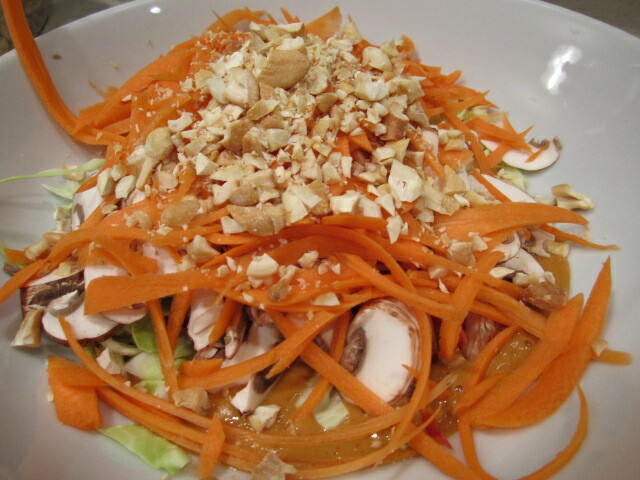 All raw veg – carrots, mushrooms, cabbage, red peppers, iceberg lettuce – accompanied by a peanut sauce. Sounds pretty blah, right? Rob and I were *this* close to licking the plate. There is something so innate about enjoying fresh food straight from the ground – it’s difficult to equally compare it to a grilled steak. 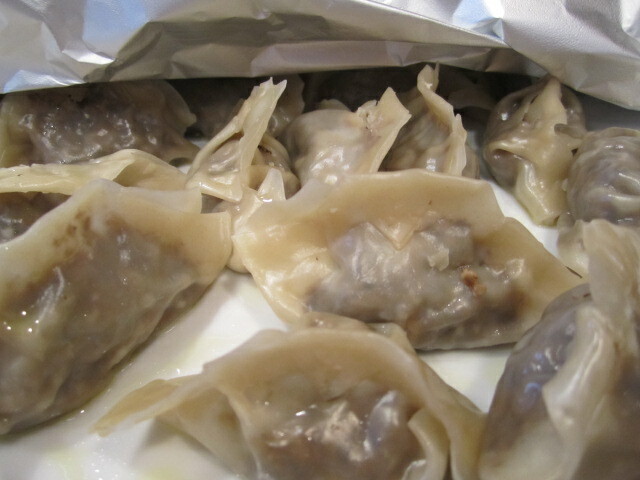 And Rob was so sweet to give me the leftovers for lunch today, not that there was much leftover. We both ate way more than our share. Our meal was healthy for sure, and a cinch to whip up, but our overindulgence negated any healthy change we were initially aiming for. 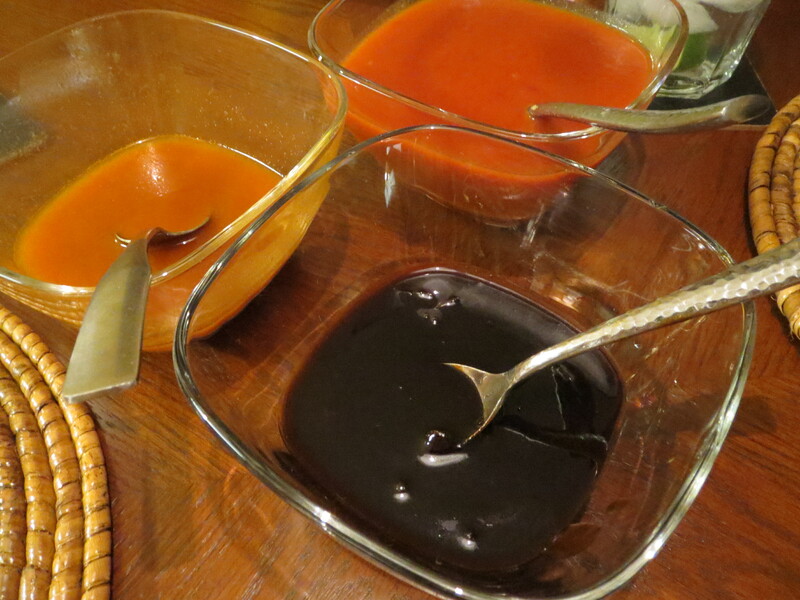 With our bellies full and warm (from the addicting spiciness of the peanut sauce), we slept like babies and woke up excited about what today’s detox cooking adventure would bring (well, at least I was excited). Next up, Spicy Black Bean Burgers. 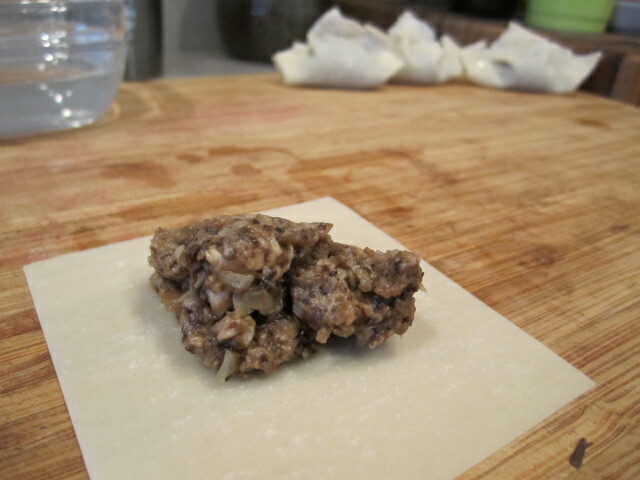 I’ll try to be more European in serving size, but with such lovely fresh ingredients, I can’t make any promises! 1 head iceberg lettuce, leaves carefully removed 1 at a time. 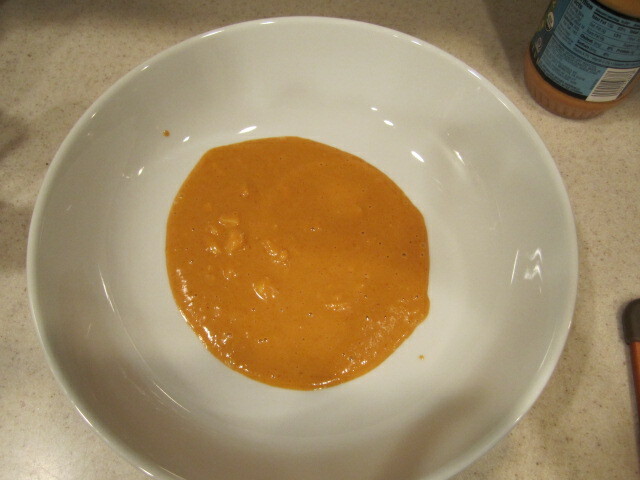 To make the peanut sauce, add all ingredients into a blender and mix until smooth. 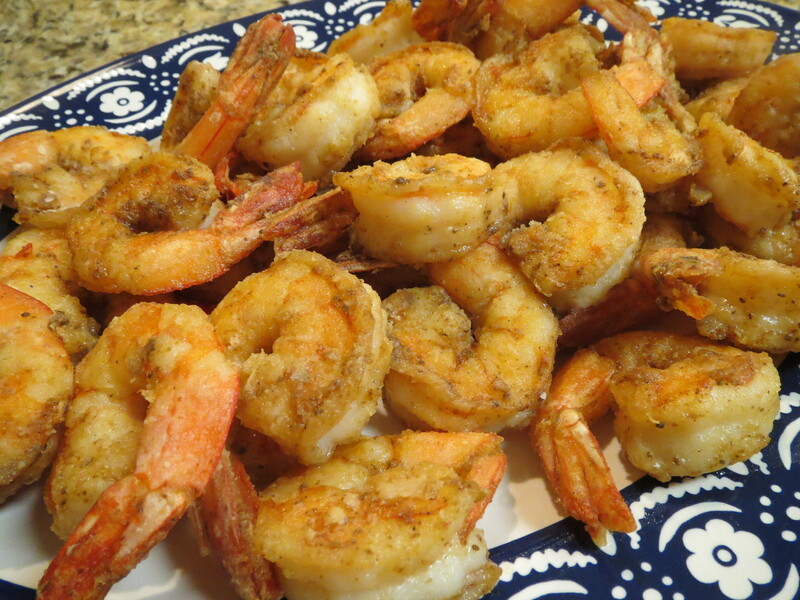 Taste for seasoning (if too strong or pungent tasting, add a bit more olive oil). 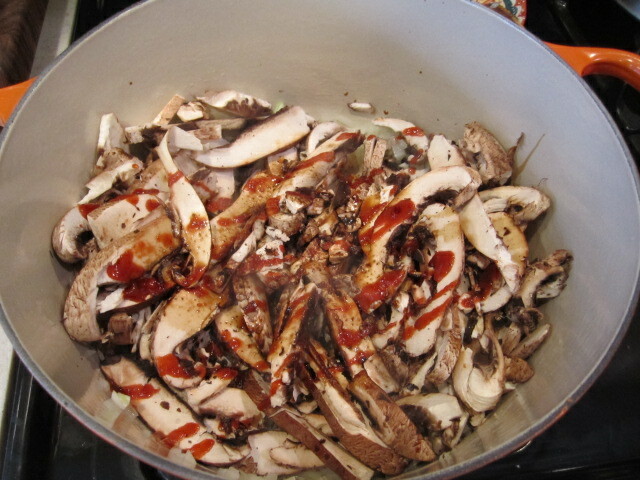 Pour sauce into a salad bowl and mix with the chopped veg and nuts. Taste for seasoning. 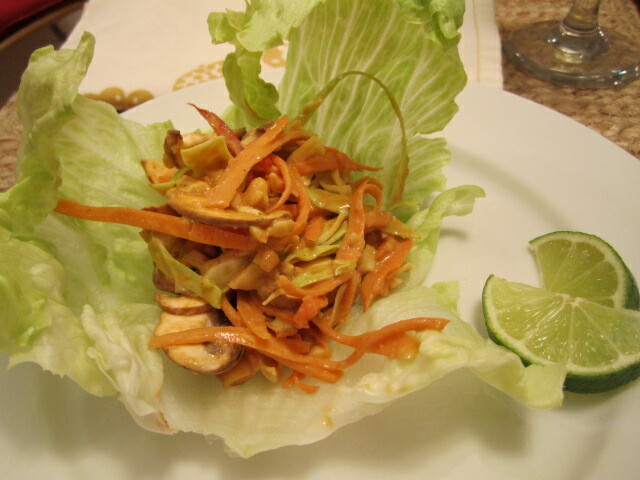 Serve with a plate of refreshing lettuce leaves, to act as a perfect fresh wrap for the sweet and spicy veg. 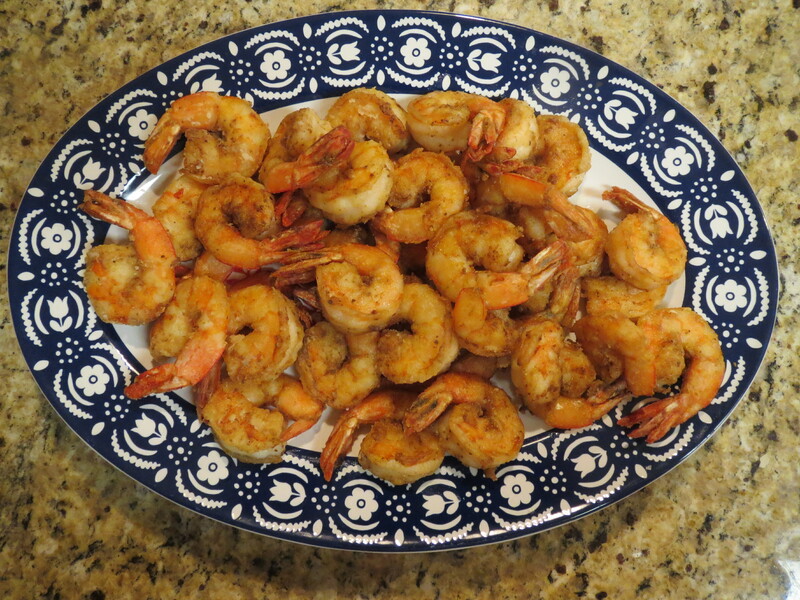 Pile them high, squeeze over some lime juice, and lick your fingers of any dripping sauce.